This year at CES, there’s a not-so-subtle trend that I’m noticing while walking the show floor in the Smart Home arena. Yes, Google Assistant and Amazon Alexa logos are proudly displayed at every booth just like last year, but that isn’t it. Smart doorbells are the new “must-have” device in every Home Automation company’s portfolio, and the amount of companies that have them on display is staggering. I haven’t rung this many doorbells since I went door-to-door selling coupon books for an elementary school fundraiser. In fact, I lost count of how many booths with Wi-Fi doorbells I came across, and in all honesty, some of them probably won’t be around next year. After sifting through the mountain of products that has become one of the hottest new smart devices, there are a few companies that released some really promising tech which we are definitely keeping an eye out for. 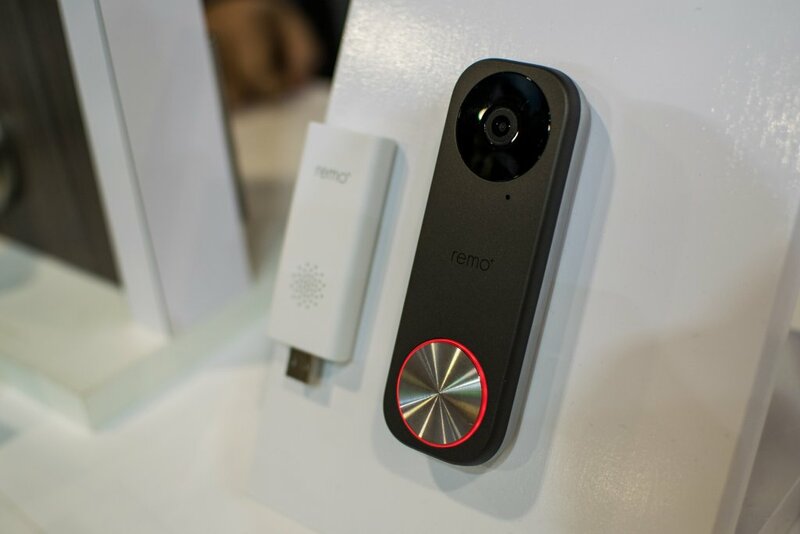 I’m not a stranger to the Remo+ platform, who started with their RemoBell battery-powered smart doorbell we previously tested out. This year, they went back to the doorbell drawing board and pumped out a couple sleeker, more attractive models. 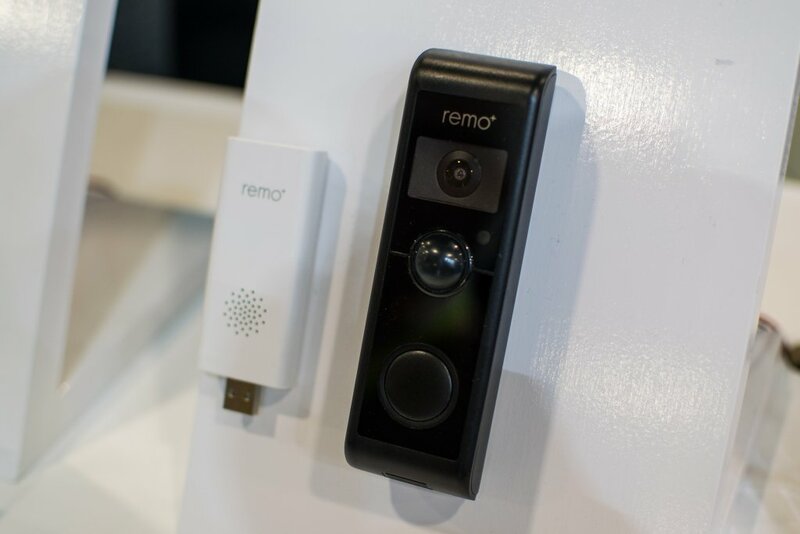 The RemoBell S is one of the most attractive smart doorbells I’ve seen yet, with an ultra-slim body that utilizes video motion detection instead of PIR like most on the market. Like many smart cameras coming out, the RemoBell S has smart motion zones, which provide customizable areas of motion detection or non-detection at the user’s discretion. This is Remo+’s higher-tier model of the two coming out next month (with a price around $199) and has a substantial wide-angle camera at 180° in both horizontal and vertical directions. 1080p video, live view, two-way voice communication, and IR night vision sensors are all also included on this model, which is hardwired. The RemoBell W is going to be offered at a slightly reduced cost (somewhere around $149) under the RemoBell S, with a few modifications to the specs. Aside from the body being just over ¼” thicker on the RemoBell W, this model uses PIR sensors for motion detection, and does not include the motion zone selection. The FOV is 160° horizontal and 120° vertical, with 1080p video quality coming on this model as well. Live view video, two-way audio, IR night vision and a hardwired power connection are all also part of the RemoBell W spec sheet as well, and like the RemoBell S cloud storage subscriptions are available. Also new to the Remo+ ecosystem is the USB-powered Wi-Fi Indoor Chime, which is compatible with any Remo+ product. Essentially this can broadcast the ringtone throughout the house wherever one or many are placed, which is a big improvement over their first-gen model which housed the ringer at the unit itself. Like any smart device worth its salt, both RemoBell models are Google Assistant and Amazon Alexa compatible, however they also now work with IFTTT which is a big new improvement as well. Maximus was the first company to popularize the smart camera/smart light combination for exterior applications like a front porch with their Maximus Smart Security Camera, and their release of the Answer DualCam rounds out their front door security network. While there are plenty of smart doorbells on the market, this is the first ever that has two cameras: one directed outwards for visitors and the other angled downwards. 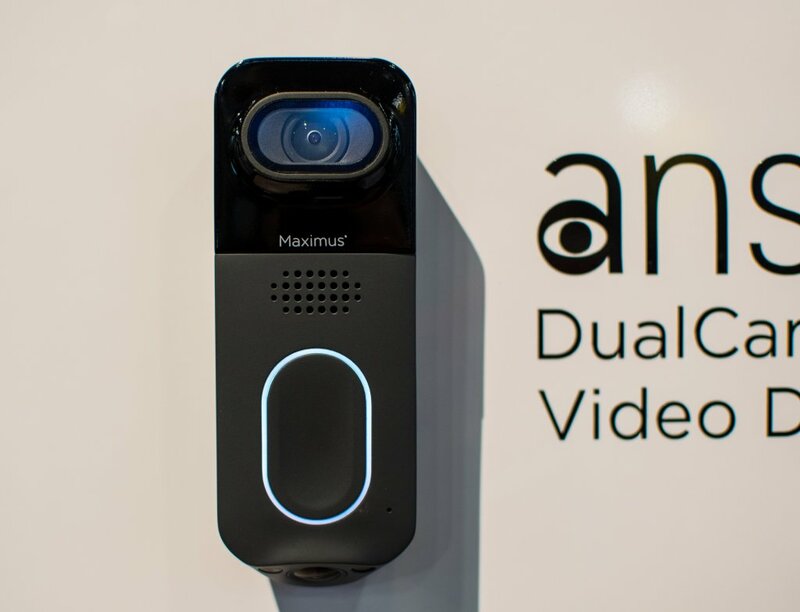 Maximus released a dual camera doorbell because they noticed that other smart doorbells had blind spots in the video feed that usually couldn’t capture the first few feet of the ground from the unit. The primary forward-facing camera is 1080p HDR, with 180° FOV and IR night vision. 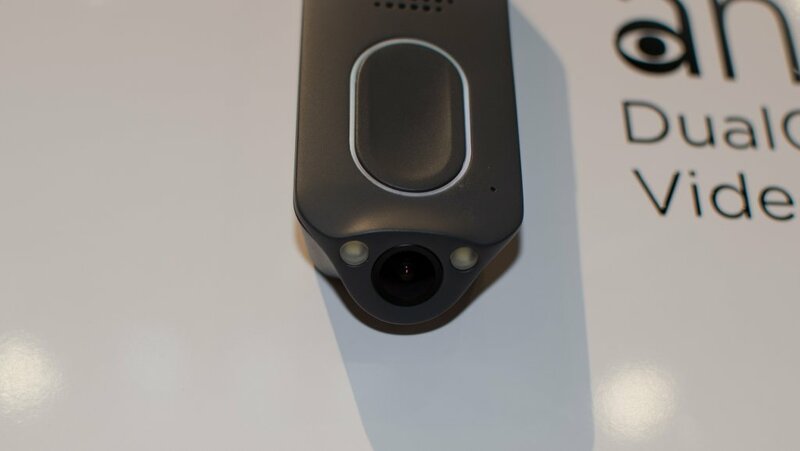 The secondary camera gets a 720p resolution, and the objective for this one as seen in the demo is to focus on package detection and monitoring. Within the app, both video feeds are automatically stitched together and can be viewed as one. One of the practical new features for this model added the other Maximus smart cameras don’t have is personally recorded greetings that can be automatically triggered upon motion detection, and a music-quality speaker. I’m fond of this because the pre-packaged sound bytes always sound fake, and giving more realism to the experience. The Answer DualCam has dual Wi-Fi connection, will be available in a hardwired model and should be hitting shelves in May for roughly $200. Just like the other Maximus devices with the Kuna app, two-way voice communication, a 100dB alarm, advanced motion detection zones, 911 calls from the app, as well as Google Assistant and Amazon Alexa compatibility come standard. EZVIZ is no stranger to smart cameras or surveillance systems but their attention has recently been focused on the front door with their DP1 smart peephole and now the smart doorbell (DB1). The DB1 will come in either white or black, and has a 3MP (2048×1536) camera that is capable of 180° vertical FOV, and has options for onboard MicroSD or cloud video storage. Wi-Fi connectivity is dual-band with both 2.4GHz and 5GHz, with the ability to view all video feeds from various EZVIZ smart surveillance devices in one app while power to the device comes from a hardwired connection. 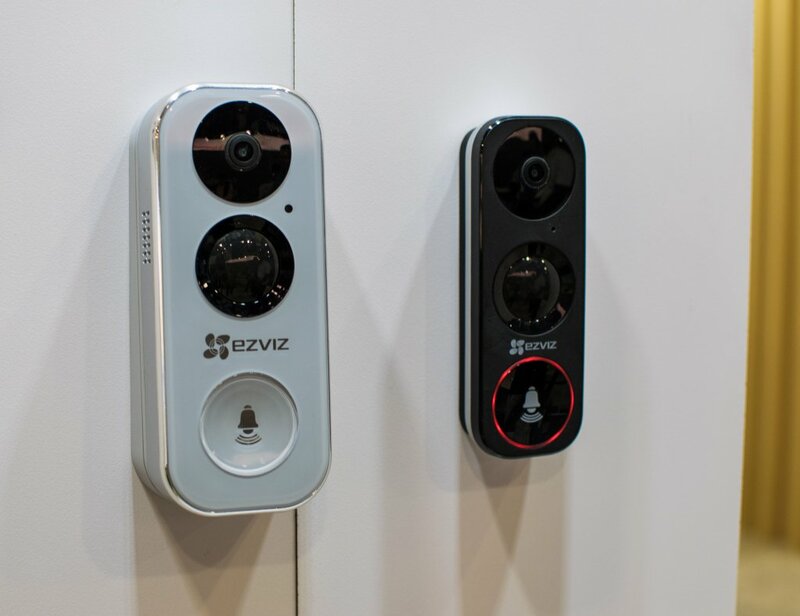 EZVIZ boasts PIR motion detection out to five meters as well as eight times digital zoom, which compliment the customizable motion detection zones and two-way voice communication features for what looks to be a pretty robust device. In person, the DB1 design looks very sleek and attractive in both colors and should be available for sale in the next month or two. I haven’t heard of Hipcam before, and almost cruised right on past their booth without much thought when I saw their standup smart cameras. What caught my eye was their video doorbells, which not only have two-way voice communications but also give the option for two-way video chat. This is something new to me in a smart doorbell, so I poked around a little more and found that the Hipcam Doorbell can be utilized as a voice intercom with their Hipcam Indoor Pro cameras as well as the app, to answer the door virtually if desired. With 1080p resolution and 136° vertical FOV, the Hipcam Doorbell also claims facial recognition and human detection capabilities as well as smart motion detection zones. Night vision is provided by dual IR LEDs and the LCD touchscreen button is customizable via the app. The power element of the Hipcam Doorbell is something that came off as a bit unorthodox to me. While the Hipcam Doorbell can be run off the 2500mAh rechargeable internal lithium-ion battery, the wired option calls for not traditional doorbell wiring but instead an eight-foot AC power cable. This came off as strange since this would require either punching holes into walls to thread the cable through to the inside of the house, or wrapping it through the door jam. 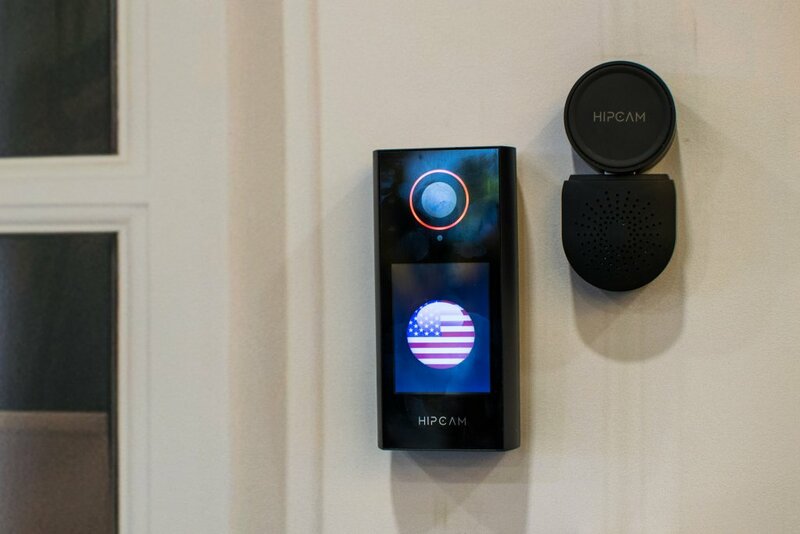 What Hipcam’s smart doorbell does have going for it though is 128-bit AES TLS/SSL encryption and Google Assistant compatibility on a 2.4GHz Wi-Fi connection. 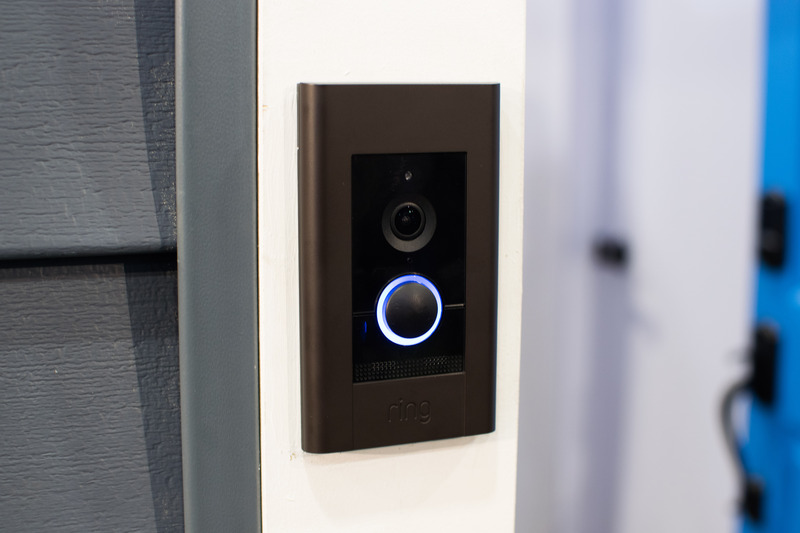 It seems that the biggest trend for smart doorbells is actually moving more towards wired models rather than wireless, namely to reduce the size and any sort of maintenance with the units. While most homes probably have existing doorbells now that wouldn’t require running new power wires, for those looking into wireless doorbells the options are becoming more limited.